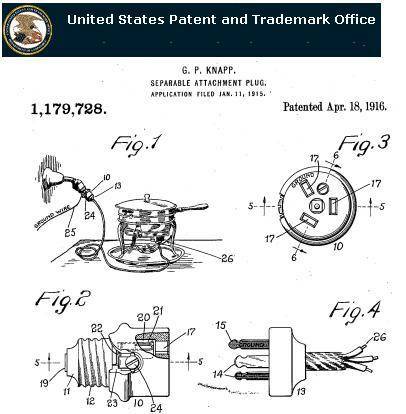 Seems that these crowfoot connectors have existed as far back as 1916, as seen at the US Patent office http://patft.uspto.gov/netahtml/PTO/srchnum.htm, look for patent number 1179728 (type this number in the search box, and on the next screen click "images" and look at figures 3 and 4. I have somewhat of a problem with running an electric fry-pan off of what looks like a lighting circuit though. The patent actually describes said appliance as a "chafing dish". Having never heard of such a thing it turns out that they still exist and are used for keeping food at serving temperature. So, maybe the current draw isn't as high as if it was actually doing the cooking. Last edited by aussie240; 10/30/09 12:20 AM. Back in 1916, that (light socket) was the only source of power in a lot of houses, at least those that even had electricity.